An old man, frail and sickly, lay in bed -- his body a wrinkled heap. His wife tended to his needs as best she could. She fed him thimbles full of clear broth, mopped beads of sweat from his brow. She ground his pain pills into powder and mixed it into watery oatmeal and honey in hopes that he would try to swallow some of it. He ached. His pain outlasted the medicine. "Can I do anything else for you?" his wife asked at the end of each day. The answer was always the same. close his eyes and wait for sleep to bring him dreams -- his only reliable elixir. Just let me dream. This is a weekend when we cannot fail to hear “I have a dream” echoing in the very marrow of our country’s bones. This is also a weekend when the necessity of keeping the dream alive (a dream of all people being equal, of a day when we will be judged not by the color of our skin, but by the content of our character) is all too apparent. And this is a weekend when we are celebrating my 25 years of ministry in West Orange—I happen to be place holder, but I most certainly did not do anything here alone. "In the last days it will be, God declares, that I will pour out my Spirit upon all flesh, and your sons and your daughters shall prophesy, and your young shall see visions, and your old shall dream dreams" (Acts 2:17, quoting Joel 2:28 NRSV). Children come into the world filled with dreams. 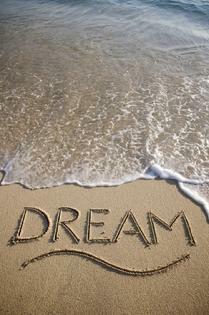 But, according to one survey, as they grow out of childhood, "the importance of dreams decreases dramatically." One seminary professor declared, "Youth dream wild-eyed dreams . . . until life sobers them . . . and they realize what can actually be achieved." I wish I could say that the “church” (universal) has been a reliable place to dream. But it has not always offered that important space to everyone. And make no mistake, dreaming is as important an activity as breathing. It is in our dreams that we may catch a glimpse of God’s call to us. of love and justice and peace. So, if you will indulge me: Just let us dream. --I dream of a day when this campus is known as a place where young children are welcome to be themselves. We love to see the neighborhood finding Easter eggs, and we are looking forward to presenting Children’s Theater this winter. I wonder what else we could do? Just let us dream. --I dream of a day when this place might be a center where we tackle difficult issues. A place where we might talk with one another about race, and class, and gender, and sexual orientation. A place where we might erase the idea that “church,” that “religion,” is all about “thou shalt NOT.” A place where people might find, maybe for the first time, God’s “Yes;” God’s whisper “You are loved.” Just let us dream. --I dream of a day when we might be more connected to other communities of faith who are struggling to hear God’s call and to be God’s ambassadors in the world. What we do by ourselves is important and sacred work. But how much more could be done if we pool our resources, our talents, our dreams? And what about those who don’t identify themselves as those of faith, but are warriors for justice. How are those networks created? How do we tie ourselves in? Just let us dream. --I dream of a day when dreams that bubble up from you, your listening, your proddings, your heart aches, can be shared, and alliances made, and plans started, and new ministries formed. Just let us dream. Now I know that some of this dreaming can make a body weary. We already do so much, how can we do more? But here is the thing. We can’t get in the way of the Spirit of God. We can’t decide that we are too grown-up to want a better world. We can’t give up the desire for change, just because it doesn’t seem realistic, or attainable. We are told to dream because God has plans for us and our world, more incredible things than we can even imagine. Dreaming takes us out of the concrete, “this is what is possible,” and opens up the horizons, widens the possibilities, deepens our dependence on the true Source, the spark that started all this in the beginning. So this weekend, let us dream. This weekend, let us be ready to hear the call in the night.